MacBook is a companion for many of the people for the whole day. Some people love to work on the Mac during nighttime without disturbance. But working long during nighttime will not only affect your physical health but also mental health. So it is necessary to take precautions when working on nighttime in order to protect your eyes. Apple offers night shift or night mode to make the display warmer in dark. This will help to cool your eyes and ensure you can have undisturbed sleep after working. Related: Increase storage space on your Mac. 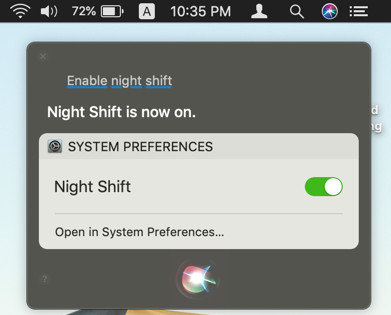 There are three different ways to access night shift mode on your MacBook. Models – MacBook from early 2015, MacBook Air/Pro from mid 2012, Mac mini/iMac from late 2012 and Mac Pro from late 2013. Displays – Apple also supports night shift mode on additional displays like Apple LED Cinema display, Apple Thunderbolt Display and LG UltraFine 4K/5K Displays. Apple introduced many new features on macOS Mojave which is version 10.14. One of the useful functions is to enable night shift mode from the Notification Center. Click on the Notification Center icon on the top right corner of your Mac. It will look like three horizontal lines with dots in front of each line. By default you will not see the night shift option. Just swipe to top of the Notification Center. Now you will two additional options – night shift and do not disturb. Enable night shift by turning the slider on. You can do this under any of the two tabs – Today and Notifications. When you enable night shift, the display automatically will change to warm colors. If you don’t like the night shift mode, then anytime you can go back to Notification Center and deactivate the night shift mode. Though this method is useful, it has some problems. Night shift mode will be active till end of the day, that is night 12 o’clock. At the start of next day, that is morning 12AM, it will be automatically disabled. So you can use this shortcut only for that day and need to enable again on next day. 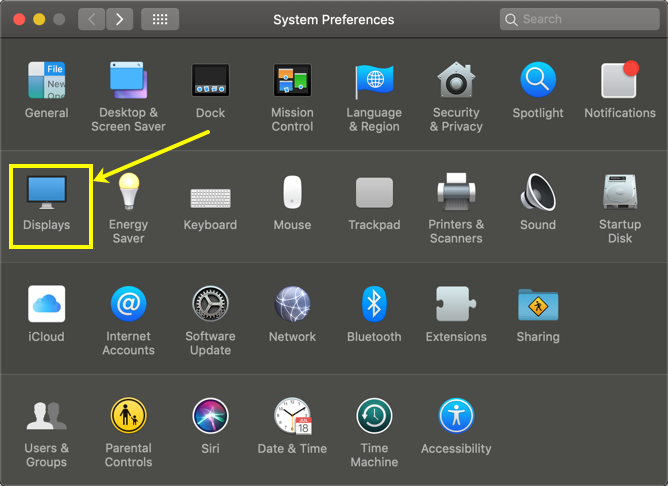 Go to “Apple Menu > System Preferences…” and click on “Displays” icon. Navigate to “Night Shift” tab to view multiple options like below. The schedule dropdown offers three options. 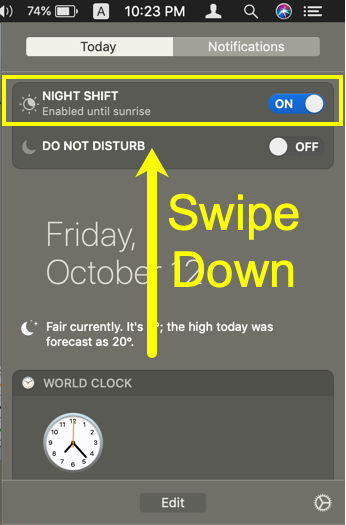 Off – by default night shift schedule is switched off on your Mac. You can also switch off the schedule after you setup. Custom – select custom option and setup from and to time. 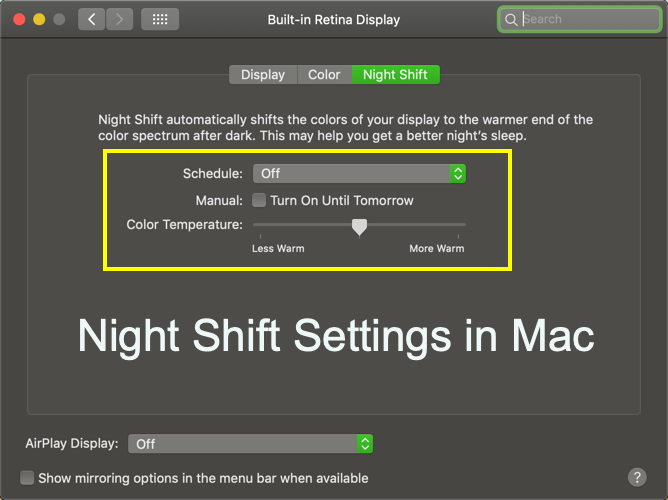 Mac will enable the night shift mode everyday only during the scheduled time. Sunrise to sunset – this will the most preferred option if you want to your Mac to schedule the night shift from evening to morning daily. But this needs a location services to be enables for the determination of the sunset and sunrise time on your time zone. 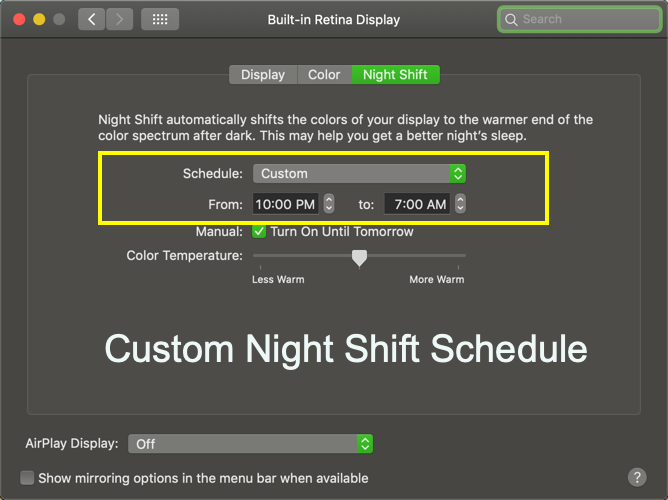 When you schedule sunset to sunrise, Mac will turn the night shift automatically. 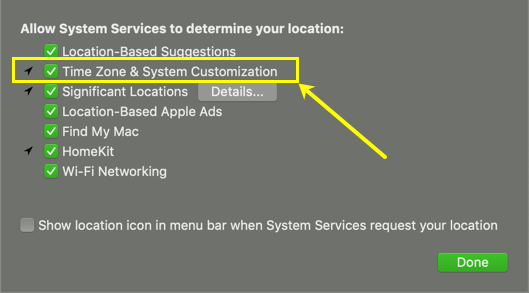 In order for this option to work, Mac should able to find your current time from location services settings. Follow the below instructions to enable location services for time zone settings. 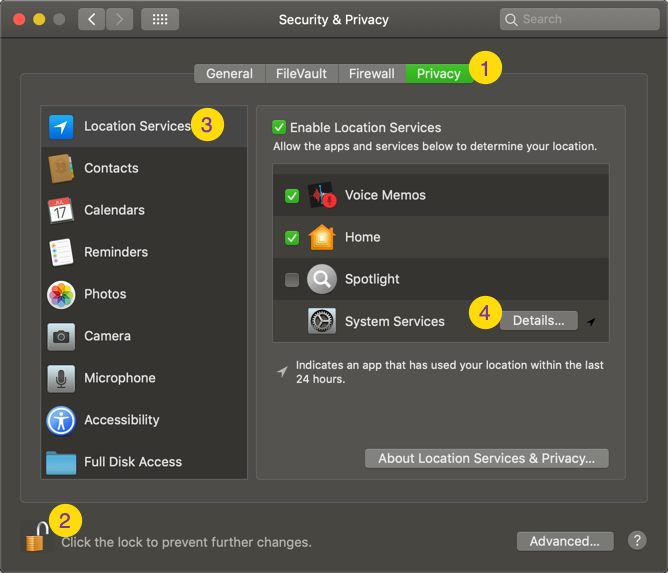 Go to “Apple Menu > System Preferences…” and click on “Security & Privacy” option. Click on the “Privacy” tab and click the padlock saying, “Click the lock to make changes”. Enter you administrator password and enable editing. Click on the “Location Services” left sidebar and scroll down to “System Services” on right pane. Click on the “Details…” button against “System Services” option. Enable the checkbox against “Time Zone & System Customization”. Click “Done” button and close the preferences dialog box. Now your Mac will determine the sunset/sunrise time and enable/disable night shift mode accordingly. Mac will select the “Manual” checkbox automatically whenever you enable the night shift mode either from schedule option from Notification Center. The description of the “Manual” option will show based on the selection like “Turn On Until Sunrise” or “Turn On Until Tomorrow”. You can drag the slider and set the color temperature to the preferred warm level. Checkout the comfortability of your eyes and choose the preferred settings for you. Related: Setup child lock in iPhone. If you are control everything with voice then open Siri and say “enable night shift”. 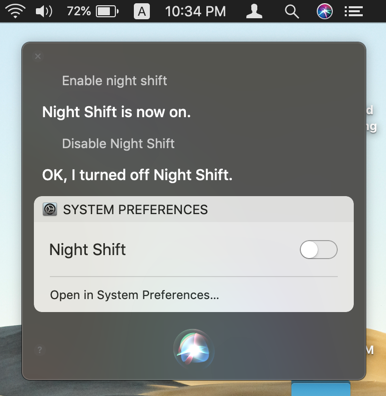 Siri will say, “Night Shift is now on” and enable it for you. Similarly say, “disable night shift” to disable it. MacBook Pro models from 2018 uses additional True Tone feature. This will help to adjust the display colors based on the surrounding light. You can enable this to have a warmer display in addition to night shift mode. Follow the below instructions to enable True Tone option. Under “Display” menu enable “True Tone” option below the “Brightness” section.